I use Cokin P Series filters for black and white photography, I think they are also called L (large). I do wish I hard started with the XL (100mm) filters now, but at the time my funds were limited. The reason is that I have a few camera lenses that need the larger size. One thing that I need to know when using these filters is the exposure factor, the affect on the amount of light they have on reaching the film. For cameras with built in meters this isn’t a problem. My Mamiya doesn’t have a meter, so I use a hand held meter and adjust by increasing the exposure as required. To do that I need the table below! These readings where taken by placing a filter in front of a Nikon D750, I also rounded to the nearest half a stop as my film cameras cannot even do halves. However I generally take a number of readings from neutral areas with a spot meter and factor in the filter affect to that calculation. I am a user of the Linux operating systems for my desktop computers, have been for years. I use Mac laptops as they were the closest to having a really good Linux install you could get for a long time, now Linux is fully functional on laptops but I still use Mac Laptops. This means that I wanted cross platform software for photo editing, something that would work on both Linux (I mostly use Kubuntu and Opensuse, Debian on servers) and Mac OSX. For a long time I used GIMP, well frequently still do. It’s a good piece of software, with a lot of functionality. However I wanted something that was more tailored to photo editing, with clearer menus. Something rather like Lightroom really. I eventually discovered Aftershot Pro 3 has a Linux version, and I figured it was worth a go. Especially as I saw it fairly heavily discounted in a sale. I will do a more in depth review at some point in the future but the first impressions are good. The import system and file management is what I would call ‘old school’. As in, you have do it yourself really. However it is lightning fast. The RAW file handling and editing is accelerated using OpenCL, with means it can take advantage of modern GPUs (inc Nvidia and AMD). The means that if you don’t mind the odd quirk around menus and file management, and they are easy to get used to, it is a fast and efficient editor. With a lot of features and functionality. So I would recommend you give it a try at least. I have a Mamiya M645 SUPER medium format camera. I have had it for a while, probably about 8 years or so. Its in pretty good condition, and fully functional. One thing that I keep forgetting is the lens conversion factors between medium format and 35mm. I intuitively know what the 35mm lengths mean now so it is useful to be able to convert. So a 645 medium format camera has a negative area of 56 x 41.5mm, which is 2.6 times the area of a (full-frame) 35mm at 36 x 24mm. This is a crop factor of 0.62075x. So the equivalent length are lower. The spread of lens I have now is good, from a standard equivalent 50mm, a 35mm equivalent, and a 28mm equivalent. The 35mm length is one of my favourites for photography, and it is also nice to have the wide angle. I would love a 90mm equivalent (150mm) for portrait work. I will keep an eye on eBay for one of the those. 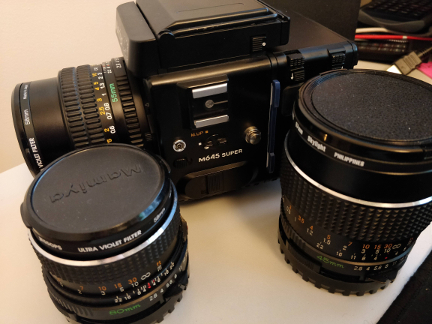 My Mamiya M645 SUPER and the three lens, 80mm, 55mm, and a 45mm. I am a linux user, well I have Apple laptops because they are solid and well made, but the rest of my computer life is Linux. This comes from years of programming. It does mean that I would much rather edit photos on Linux, or at least software that works in Linux and OSX. That criteria rules out Adobe product, they don’t work on Linux. So with no Lightroom available I tried out a number of opensoure editing tools. I didn’t find any of them that great to use. I eventually downloaded Corel Aftershot Pro 3 to give the free trial a go. Its pretty good, does everything I need and the interface is nice, it didn’t take very long for me to get used to it. My only gripe is that the filing system for photographs seems a bit strange. The way photos are added to albums results a slightly messy filing system. I think this could easily be changed, it is something they should really look at. Another big plus is that it works on Linux, OSX and Windows, and can make use of hardware acceleration in GPUs. So its quick. On the video side of things I ended up picking Lightworks. This is a super powerful piece of software, and can do far more than I currently need. The software feels old, and by that I mean that the interface seems to have been designed before some of the normative GUI designs became established. So it can seem a bit arcane. I actually do like it however, the design makes you focus on what you are doing and avoid being distracted by other things. Again this software works on Linux, OSX, and Windows. I have education version which is a bit cheaper than the pro version, that said the free version is really good and does a lot.